We're very early into 2018 and I've already received to cover albums. I'm hoping it's not a trend. The first came from Sweden, The Poodle's Prisma, something that turned out to be a mixed pleasure. Now, here's Germany's Mystic Prophecy wanting to put their heavy power metal twist on some pop and rock tunes. Vocalist R.D. Liapakis explains more: "I've always been a huge fan of pop and rock music of the 70's, 80's & 90's and I always asked myself, how these songs would sound Mystic Prophecy-style. That's why I began searching for well-known songs, that also mean something to me personally and that bring back memories, respectively. Personally, I think that the 70's and 80's are the golden age of pop and rock music; a time that also influenced me musically." The full track track listing follows below, and it's a rather diverse selection of artists from The Supremes to Lenny Kravitz, Creedence Clearwater Revival to Patti Smith. We'll highlight some of the best and the, well, maybe not so great ones. You Keep Me Hangin' On is one of my favorite Motown songs, yet I've always preferred the Vanilla Fudge version,, more groovy. 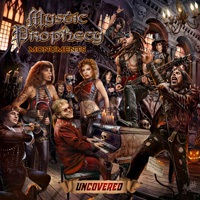 Mystic Prophecy does this song well, especially getting the vocal arrangement correct. Another fine rendition is the cover of Lenny Kravitz's Are You Gonna Go My Way. Kravitz has somewhat of a metal heart, so Mystic Prophecy giving it the power metal twist fits. They also do a fine job with Patti Smith's Because The Night, especially with the acoustic guitar opening which establishes the melody. Also, vocalist Liapakis gets the soulful urgency of the lyrics and chorus. I always thought CCR could get the heavy metal treatment, especially Run Through The Jungle and Fortunate Son. Mystic Prophecy does a blistering version of Proud Mary. Similarly, Billy Squier's The Stroke gets the metal treatment, where that familiar beat, groove, and chorus get Mystic Prophecy's razor sharp riff treatment. The same could be said for T.Rex's Get It On. You have to get the beat, groove, and chorus right, or you'll muff it. Mystic Prophecy nails it, metal-style. Of some disappointment was their cover of Elton John's I'm Still Standing, merely because it's really hard to get John's soulful vocal presence. But not too worry, The Poodles muffed Goodbye Yellow Brick Road. Monster Magnet's Space Lord sounded like, well, Monster Magnet just getting a bit sharper in the latter half. Excepting Tubular Bells from The Exorcist, I'm not all that familiar with Mike Oldfield, so Shadow On The Well didn't impress me. All in All, with a few exceptions, I enjoyed Mystic Prophecy's heavy metal take on some classic pop and rock song. I don't think I'd like a constant meal of them, but Monuments Uncovered was both interesting and entertaining. Recommended.